The semester seems like it just started, but graduation will be here before you know it! Now is the time to order your graduation regalia. Rent your graduation regalia online from Herff Jones by Tuesday, October 30, 2018. The colors are specific to your conferring university. Pick up your order beginning Monday, December 3, 2018, at the campus you indicated on the order form. 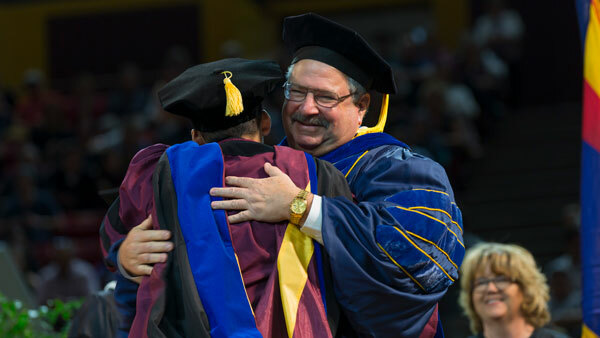 If you miss the October 30, 2018, online ordering deadline, the Tempe campus bookstore will have faculty regalia in stock and available for rent up to the day of graduation. If you rent your regalia during this time it will be in ASU colors, not the colors of your conferring university. Purchase your custom faculty regalia from Herff Jones by Friday, October 12, 2018, by filling out the form of your academic level below and email it to haylie@southwestgrad.com. Custom regalia takes six weeks for production plus transport time. Orders after Friday, October 12, 2018, will incur additional expediting charges. Need to get your measurements taken? Meet with Herff Jones at the Polytechnic and Tempe campuses to get your measurements and have Herff Jones write up the order in September.